In what is promised to be an annual tradition, the Graduate Student Council threw their largest event this year, the Doctorate Dance. Overlooking the city skyline, the Park Tavern formal offered some of Atlanta’s smartest with a reason to schedule their experiments early. While some dawned sundresses, I found the doctoral students who knew how to do formal right to share their research interests and their style with you. Kelsey Maher is a 3rd year in Biochemistry, Cell and Developmental Biology with a bowed ribbon appointed back. Taking a break from characterizing epigenomic chromatin markers important for plant genetic transcriptional enhancers, Kelsey decided to take her junior prom dress out for a spin. uncovered her dress from the back of the closet, tore the tags off and was ready to go. A 2nd year in the Graduate Division of Religion, her research interests focus on the influence of culture on ethical development. is a 2nd year in the Neuroscience Program and is turning heads in her diamond-backed dress. While shy to take a photo for this reporter, she’s not shy about diet-induced obesity inflammatory response in the hypothalamus. sparkles were originally a New Year’s Eve outfit that needed to come out of hiding. When not researching brain-machine interfacing, this biomedical engineer is rigging maxi skirts and black jumpers into beautiful evening-wear. Jasmine Hope is a 1st year in the Neuroscience Program. She might or might not have left lab pretty early the day of the dance to get her hair professionally done. This day of being dolled up is a brief break from her real interest in the potential ability of attention tasks during rehabilitative training to improve sensorimotor excitability in people with spinal cord injury. are both Neuroscience graduate students who know that formal and floor length go hand-in-hand. Rachel found this beautiful floor length number from craigslist. “I passed a couple twenties through a car window as the woman handed me the dress in a dry-cleaning bag in an elementary school parking lot up in Tucker.” Rachel studies how variation in monoamine vesicular loading capacity influences dopaminergic and serotonergic circuit dynamics, and the resultant effects on complex behavior. Amielle, on the other hand, puts together articles about how graduate students dress. Left to Right Crystal Grant (President), Christine Doronio (Ticket Czar), Ashley Parcells (VP), Sarah Lauinger (Travel Treasurer), Rachel, Elizabeth Minten (Secretary). This illustrious group of GSC council members was the master minds and organizers behind this year’s biggest Graduate Student event. 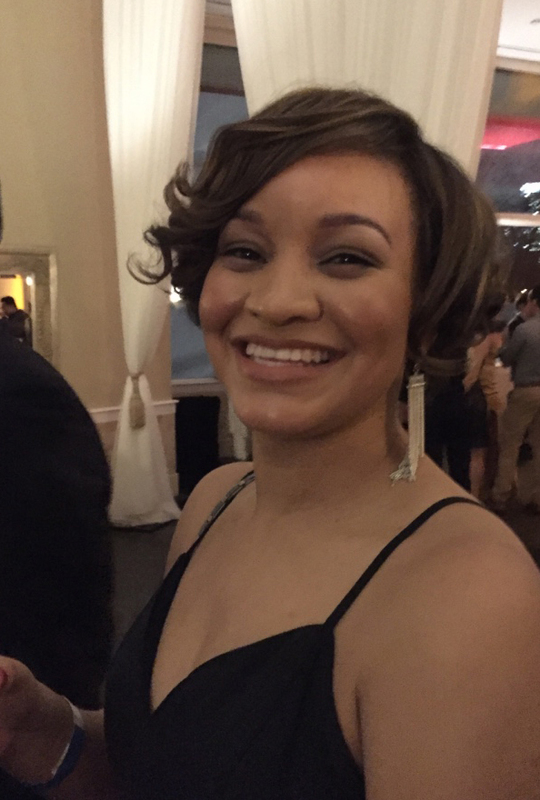 The idea of the dance came about quite naturally “In our first GSC executive board meeting of the year” says Crystal Grant the 2016-2017 President of GSC, “I mentioned that I wanted to see a formal event like the Cadaver Ball or the ball the law students get each year for PhD students. And Rachel, our Social Chair, was amazing and really made it happen (with help from the rest of the board of course). Brindar, our Ticket Czar, gets credit for the name--Doctorate Dance! (I'm pretty sure I had a dumb name in mind like PhDance).” Crystal studies changes to DNA and chromatin with age in humans and is the first on the left in the picture above. Alumni might remember how these events were welcome respites in the graduate school grind. Towering ceilings and a picturesque night city skyline made the Park Tavern a magical spot to see old friends and their dates.